It’s a story Union fans have seen over and over in the offseason. There are holes in two rosters as preseason training officially begins. As of today, the Union have up to eight available spots and the Steel have up to eight available spots to fill for the upcoming season. True, sporting director Ernst Tanner signed veteran defenseman Aurélien Collin yesterday and there are rumors about Carlos Miguel Coronel, but Tanner has some more signings to make. 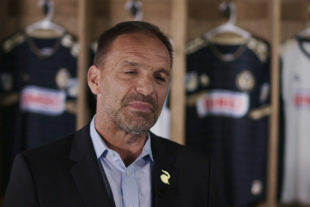 The Union are behind the curve when it comes to offseason signings. It almost always comes back around to bite the club when spots are filled a little too late in the offseason and the team chemistry just isn’t there. When Tanner took the money and ran from the SuperDraft, he made it pretty clear that he’s looking for some more experienced players. That’s understandable, but there are eight open spots. It’s time to use that money. So, who should Tanner be signing next? The biggest problem last year was the offense. There are now four forwards on the team, two brought in by Tanner within the last few months. Also, Yomi Scintu, listed on the preseason roster is a forward currently with VfB Eichstätt. Notice that there’s no dedicated number 10 in the roster. Of the current midfielders, Fafa Picault, Ilsinho, Aaronson and Bedoya are the most attacking midfielders, but none really fit the bill. Does this mean that a) the Union’s new shape will remove need for a traditional number 10, b) that one of them be forced into a number 10 role in traditional Union fashion, or c) will Tanner spend the money for a creative attacking midfielder? Of course, we probably won’t know until we see more of the preseason training, which hopefully, won’t be too late. Not unlike the Union, the Steel are in need of some signings soon. The known players are Faris, Selmir Miscic, Michee Ngalina, Saed Diaz, Zach Zandi, James Chambers and Ben Ofeimu as of earlier this morning. That leaves the Steel with eight spots they have to fill to hit 15 like last season. Bethlehem will most likely look to their academy players to bolster their squad. Tanner blowing up the draft had more of a negative impact on the Steel. While those picks wouldn’t have helped the Union much, they could have helped Bethlehem. It’s not the most likely way the Steel would acquire players, but now the focus on young academy and international players has been intensified that much more. So, who should the Steel be considering? First and foremost, Bethlehem need a solid starting defense. Earlier this month, PSP’s Tim Jones said that the Steel are in need of a starting right back, and, perhaps, a third starting center back for “tactical flexibility.” Agreed, which is why signing Ben Ofeimu was a smart move. Here’s another defender from the academy that the Steel could sign. Nathan Harriel. The US youth international defender grew up playing for Chargers Soccer Club in Florida and recently joined the Union’s academy. If his Twitter account is any indication, he wants to play professionally and would sign with the Steel. Currently, the Steel have two forwards on their roster. Burke was known to change around his lineup from match to match, so it’s never a bad thing to have more options on offense. Here’s a forward Bethlehem could potentially sign, or at the very least not forget about. Issa Rayyan. The forward is a bit of a long shot, he’s technically no longer an academy player and he’s been enjoying his time at Duke. Rayyan had a strong first season with Duke and was named 2018 ACC Freshman of the Year. He’s on the list because he has strong feelings for the Steel and the Union, he’s made appearances for Bethlehem and he wants to play professionally (at some point). Four of the six players on the Steel’s roster are midfielders. The academy is full of young, talented midfielders that the Steel can easily choose from. Also, it’s important to remember that despite being on the Union’s roster, Aaronson and Fontana will probably be wearing a Steel jersey more than a Union jersey this season. Brenden Aaronsen will be one of Bethlehem’s regular attacking midfielders and Anthony Fontana will be a regular central midfielder. Finally, goalkeeping is a bit of a question now that John McCarthy has been released by the Union. McCarthy was used by the Steel, but Jake McGuire was the regular keeper last season on loan from the first team, and Tomas Romero from the academy made appearances. Really, it’s more of a question for Director of Goalkeeping, Oka Nikolov to answer and will probably not be an actual signing by Bethlehem. As I see it, there should be zero concern with Steel’s roster. there are the signings already made, then there is an academy filled with players. …Steel serves one purpose. ONE. I agree, Mighty Elephant, but consider the difference in success in achieving that end between the Bethlehem Steel and Toronto FC II. If coach Burke can actualize Herr Tanner’s faith in the Academy, he and coach Hogan should be applauded. Who wants Gregory Van der Wiel in blue and gold? I heard he’s a coach’s dream and brings zero drama into the locker room.